Confessions From A Stay At Homo (SAHM): What a Difference a Year (and $5) Makes! 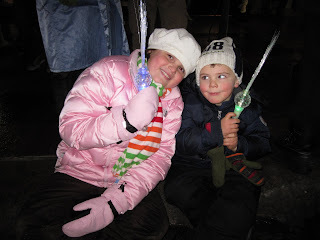 We went to Holidazzle last night. We felt some trepidation after last year's fiasco but he is a year older and, well, we caved. This year, we decided, in times of recession and economic glut, to give in to consumerism. To help the economy grow. To not take this moment to teach a lesson. We let them have a little lighted glowey-goodness. You'll see in these pictures evidence of their contentment. 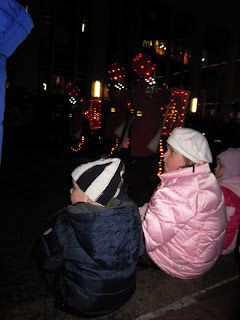 He actually SAT (I didn't have to chase him and worry that he'd be run over by a float), he didn't attempt to steal one of the lights from another kid, and they seemed to actually enjoy themselves (other than the time that the blackened, sooty slush splashed up into their faces). Jackson got the $5 light thingey too. The older kid next to him got one and...yeah...it was 100% unavoidable. 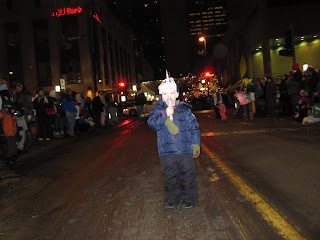 (But it did make the experience nicer for everyone since the floats were pretty far apart.) GREAT skating pictures!! !